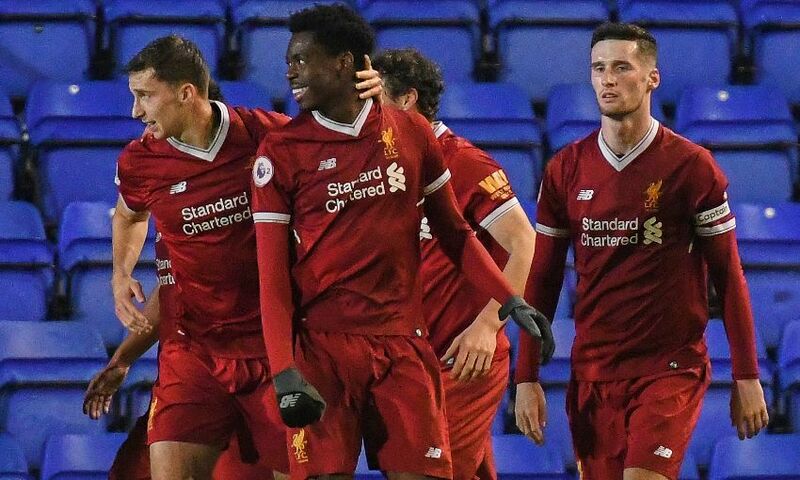 Ovie Ejaria scored a sublime solo goal to give Liverpool U23s a 2-1 victory over their Newcastle United counterparts in a Premier League International Cup tie at Prenton Park on Friday night. The midfielder secured a win for the Reds with 17 minutes left on the clock when he collected substitute Liam Millar’s backheel and jinked his way beyond a defender and the goalkeeper to net. It completed the turnaround for Neil Critchley’s side, who had initially fallen behind to Callum Roberts’ first-half opener. However, on the night Rhian Brewster returned to club duties, Matty Virtue levelled for Liverpool before the break, enabling Ejaria to make certain of three points in Group A for the hosts with his moment of magic in their opening game of the tournament. With plenty of interest in Brewster following his exploits at the FIFA U17 World Cup with England, the youngster could have opened the scoring inside the first 60 seconds. 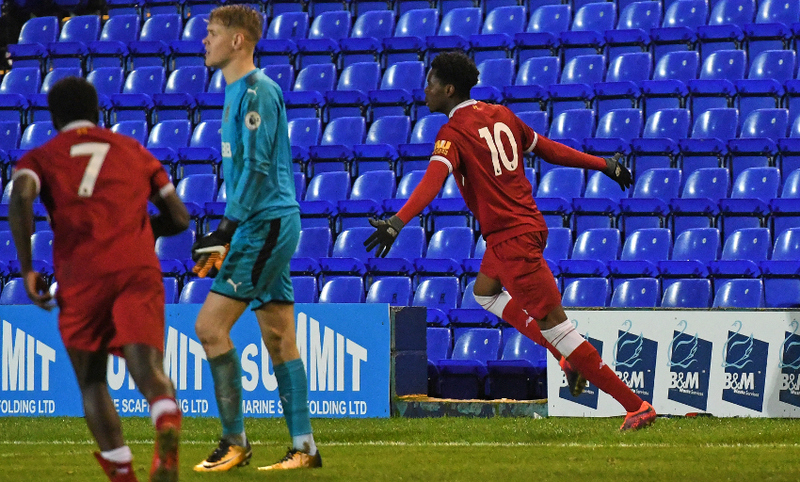 Ejaria threaded through a ball for the forward to run onto, which he looked to steer home when one-on-one with Nathan Harker, but the Newcastle goalkeeper was able to repel. The visiting stopper thwarted Brewster again moments later, this time keeping out a drive from the edge of the area after a burst of speed had created a shooting opportunity. Liverpool went closer still on 18 minutes when Bobby Adekanye jinked into space before watching his attempted cross take a deflection and loop over the head of Harker; however, Josef Yarney was on hand to hook the ball away on the line. It had been all Critchley’s men, but they were to find themselves behind with 22 played in Birkenhead. Roberts latched onto a wayward pass inside the box from Virtue and clinically curled it beyond Caoimhin Kelleher to break the deadlock for the Magpies. But the Reds’ riposte was a swift one and, after Cameron Brannagan was foiled by a stop from Harker, Virtue restored parity and atoned for his earlier error, prodding in from close-range at the second attempt after being picked out by Adekanye’s low centre. It ensured the sides returned to the dressing rooms on level terms at the break, but it was the Magpies who made the more enterprising opening to the second period. Indeed, only a fine save at point-blank range from Kelleher kept out Tom Heardman’s towering header, while Victor Fernandez should have caused more panic when he struck wide after Juanma’s misplaced pass was seized upon 20 yards out. Next, Dan Ward weaved his way into the Liverpool box just after the hour, though couldn’t keep his blast down as it cleared the hosts’ crossbar, before Roberts was inches away from finding the bottom corner after bursting in from the right soon after. On 66 minutes, Brewster was withdrawn from the action having only resumed training at the Academy this week. His replacement was Millar, the U18s attacker entering the action for a first appearance at U23 level. The Canadian was instantly involved as the Reds were left wondering how they hadn't gone in front. Brannagan’s skimmer from the edge of the box was parried by Harker. Millar was quickest to the rebound and pulled it back for Virtue to strike the post prior to Adekanye somehow having his follow-up blocked on the line. But Liverpool were to go 2-1 ahead – and it came courtesy of a sublime solo effort from Ejaria. Millar’s cute backheel through a crowd of bodies found the midfielder inside the box, who steadied himself, danced beyond a defender and then rounded Harker before slipping into the now empty net. It was enough to pick up the win for the Reds, though they survived a late scare when Conor Masterson inadvertently deflected the ball towards his own goal deep into stoppage-time, but Kelleher was able to prevent it from finding the bottom corner. Liverpool U23s: Kelleher, Whelan, Juanma (Johnston 53), Jones, Masterson, Brannagan, Adekanye, Virtue, Brewster (Millar 66), Ejaria, Dhanda (Kane 82). Subs: Firth, Parker.